Medieval Times invites you to travel back to the 11th Century. Set within an 11th Century European-style castle that includes interior displays of medieval artifacts, coats of arms from prestigious Spanish families and spectacular shining suits of armor you'll feel as if you're been transported back in time. You'll treated to a one-of-a-kind dinner experience hosted by King Carlos and Queen Dona Maria Isabella that will keep you on the edge of your seat. 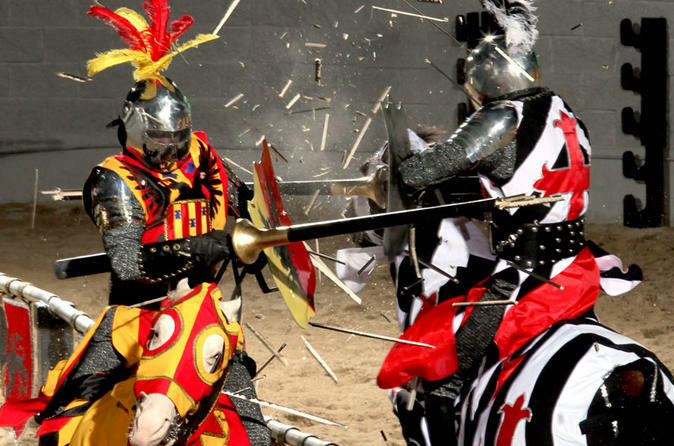 Witness an amazing show that presents a rousing live jousting tournament and classic sword fights. Marvel at awe-inspiring horsemanship and falconry. Seated in the castle’s climate controlled Grand Ceremonial Arena, where after receiving colored crowns, you'll cheer for one of six knights (donning matching colored tunics) who chivalrously vie for the honor of Queen’s Champion. With so much excitement, you’ll build up an appetite. The castle’s serfs and wenches will serve a delicious “hands-on” medieval-style four-course meal that includes garlic bread, tomato bisque soup, oven roasted chicken, herb-basted potato, corn cobbette, pastry of the castle, coffee and non-alcoholic beverages. Also available are delectable vegetarian, Kosher and Halal options. A full-service bar is also available for adult guests. Special Offer - Book and save 18% compared to the local supplier's prices! - Book Now!